Why is Instagram engagement important? And why do you decide to follow certain brands on Instagram and not others? There has been a massive shift from using sheer follower numbers to measure success on Instagram to now instead focus on actual human engagement. After all, the platform prides itself on the fact that Instagram engagement with brands is 10 times higher than it is on Facebook, 54 times higher than Pinterest, and 84 times higher than Twitter. And it intends to keep it that way. The problem? Authentic Instagram engagement takes time and effort to generate. And in a world where everyone is looking for shortcuts and quick wins, this is indeed a challenge. The payoff, however, is that having even just 200 die-hard, loyal fans will always be better, and more profitable, than having an account with 200,000 fake followers. 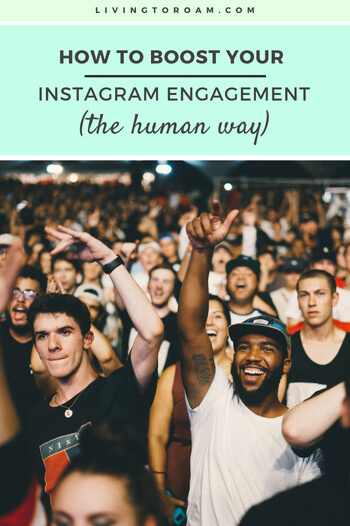 In this post then, you will learn 4 ways to boost your Instagram engagement by creating real, human connections with your followers. So if you’re ready – let’s start by talking about the power of your words. Your audience loves pretty pictures there’s no denying that. But what they love more than that is feeling like they’re getting a peek into what it’s like to be you. If you can take them along on the adventure behind the photo – you’ll turn simple followers into raving fans. Everyone is out there focusing on the cohesive colour schemes, the filters and the picture-perfect moments that took hours to curate in order to give them that ‘candid’ look. And while they’re all busy doing that, let’s talk about two accounts whose engagement is off the charts even though they’re focusing on none of these things. The limit for the Instagram caption is 2,200 characters. 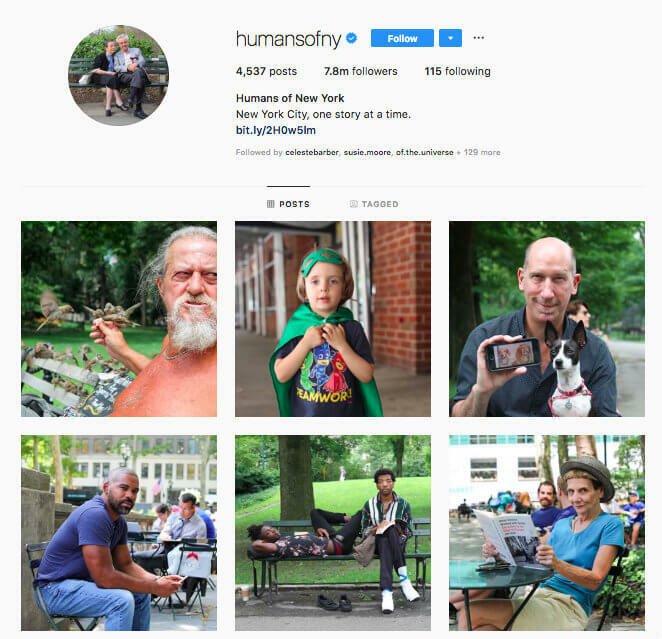 And you’ll often see @humansofny using every last character of this limit to tell the story behind each photo. Each photo gets thousands of real, raw responses from the followers of the account because of the incredible connection that comes from a candid photo of each regular New Yorker and their unique story told from the first person perspective. I challenge you to go read a few of their posts’ captions and not feel joy, sadness, anger, disgust or sympathy. I can almost guarantee you that it’s not possible. The reason is that when we hear stories, our brain acts as if we’re feeling the stories. And our feelings, in turn, make us feel as if we’re living through these stories. You just can’t get any more human than that, and the incredible rates of Instagram engagement on this account definitely reflect the power of great storytelling. 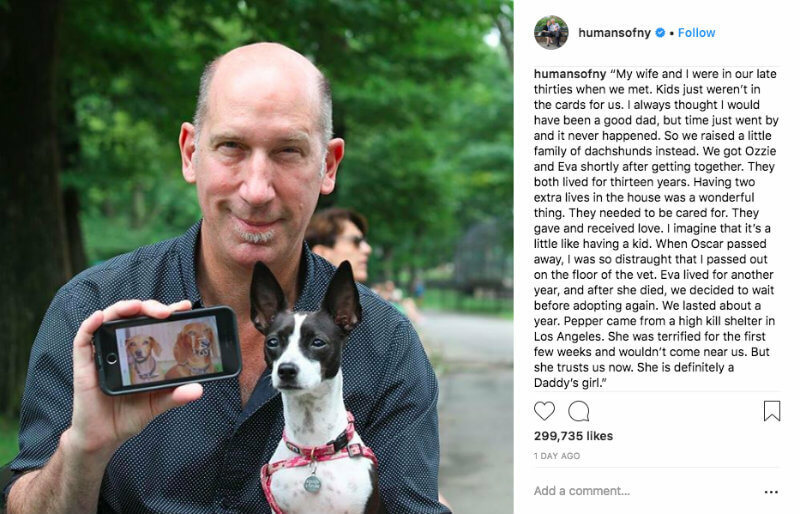 While Humans of New York is a brand all on its own, @vodkafordogpeople has managed to leverage the same power of storytelling (although on a much smaller scale) to connect a worthy cause with their product. 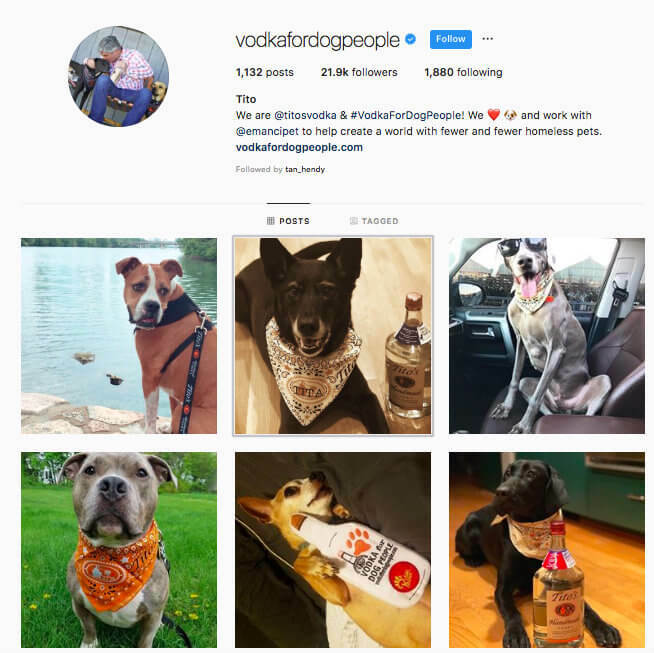 The posts are made up of user-generated content featuring the stories of adorable pups posing with Tito’s Handmade Vodka and people are absolutely loving it! So don’t be afraid to get creative and think outside the box to create this kind of storytelling magic with your own brand. 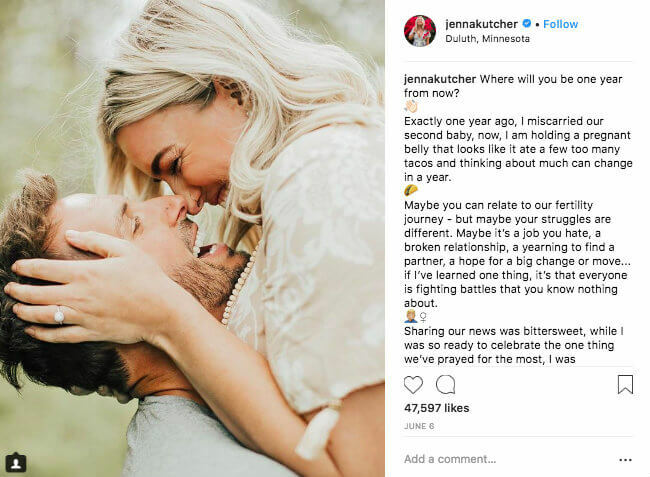 One of the best accounts for this (in my opinion) is from Instagram superstar @jennakutcher. She has built her entire brand on sharing everything with her followers. From her struggles with conceiving and having self-image issues all the way through to how it feels to be attacked by haters online. The result? Her Instagram engagement is through the roof as her die-hard fans cling to every single word in her captions. At the time of writing this account has just short of 600k followers and regularly receives a 10% engagement rate or above, which is almost unheard of for an account of that size. So getting real and vulnerable definitely works for personal brands. But this advice may get a bit of resistance from the more corporate accounts out there. Which is understandable. After all, it’s difficult to get real, raw and vulnerable if you’re a tech company, for example… or is it? Using two of the biggest tech giants out there Microsoft and Apple, let me show you how even the most corporate of corporations leverage the power of real human emotion through their posts. 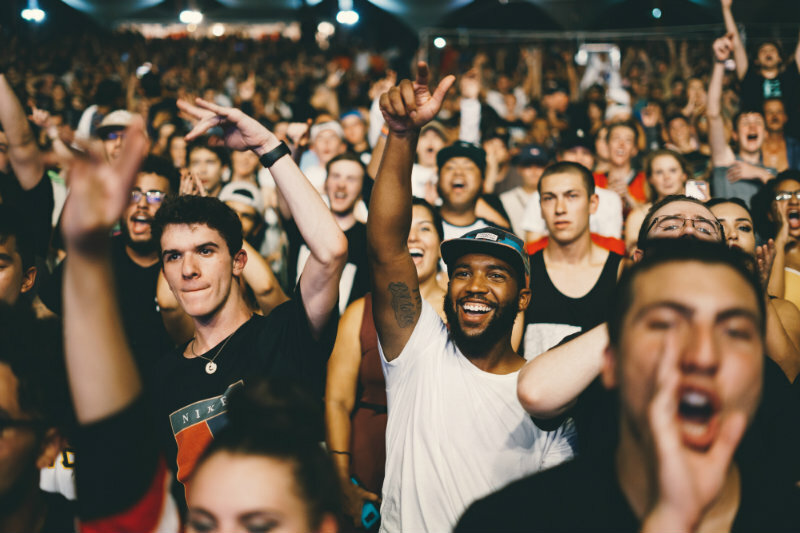 While a lot of corporations try to stay away from controversial topics, there a few who know that it’s important to show your audience what you believe in if you want them to really connect with you. 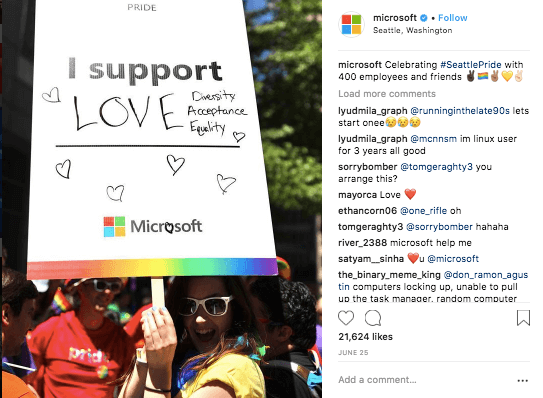 This post from @microsoft clearly shows their support for the Seattle Pride Parade and as they mention in the caption they were celebrating with employees and friends. They even finished off their caption by using multi-racial peace sign emojis. This is a great example of how to engage with your users even as a corporate account by connecting over a common cause. Apple has taken this concept even further by having their account be 100% user-generated content. 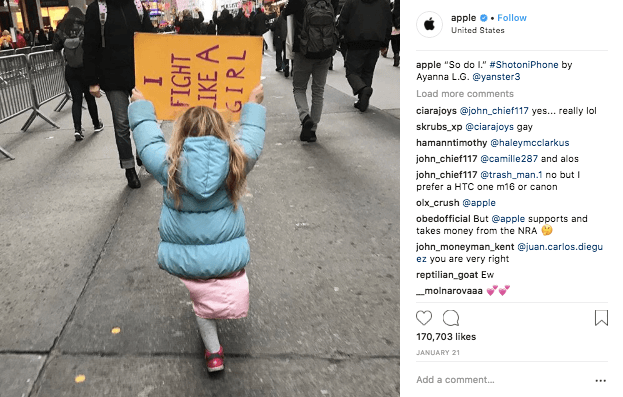 They’ve done this by getting people to use the hashtag #ShotOniPhone to get a chance at being featured on the @apple Instagram account which at the time of writing has a whopping 6.5 million followers. User-generated images like the one above are a perfect win-win in so many different ways. Firstly, Apple is building their social proof and it means they don’t have to spend big bucks on creating new content from scratch. Secondly, it’s tapping into customer’s emotions by making them want an iPhone so they can take photos like the ones in their feed. It’s also making their existing customers feel special – like they’re a genuine part of Apple’s business and simultaneously giving them an opportunity to grow their own Instagram account by featuring them. This account is as real and raw as it gets. It features no actual Apple products – just the stories behind them which is exactly what creates authentic Instagram engagement. Not to mention that user-generated content has a 4.5% higher chance of conversion. A number that increases to 9.6% once they interact with the photo. The reason for this is simple – we buy from people we know, like, and trust. And nothing develops our trust in a brand quite like the unbiased opinion of other ordinary users. You’ll often see people in Facebook groups continuously asking for ways to get higher-quality Instagram engagement.. And yet it’s the exact same people that post captions like “what a sunrise this morning”. This makes it difficult for even the Shakespeare-wannabes of the world to come up with a clever response. Chances are, even your die-hard fans will respond with a sunrise emoji and not much else if you don’t give them a call-to-action they can really engage with. 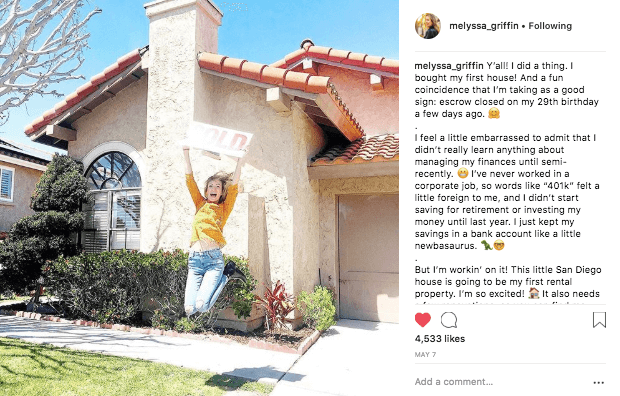 This post from @melyssa_griffin demonstrates this perfectly. First off, the post itself is so imperfectly-perfect. The glare on the sign might make it hard to read it but the look of sheer joy and excitement on Melyssa’s face says it all – this house has been sold! She then continues to get incredibly real within the caption by saying she’s only recently started looking into how to manage her finances. This will likely come as a surprise to her followers who know that she has earned over 7 figures from her business. This call-to-action led 286 Instagrammers to respond, making it a slam-dunk for the power of vulnerability! Another way to give people a reason to engage is to involve them in the evolution of your brand. Are you deciding on a new logo for your business? Or maybe you’re looking for a new product to feature on your online store. As business owners, there are always decisions to make and paths to choose from. Why not let your followers in on some of that action? This is a campaign from @burgerking created to celebrate the 199th Anniversary of National American Sign Language Day. 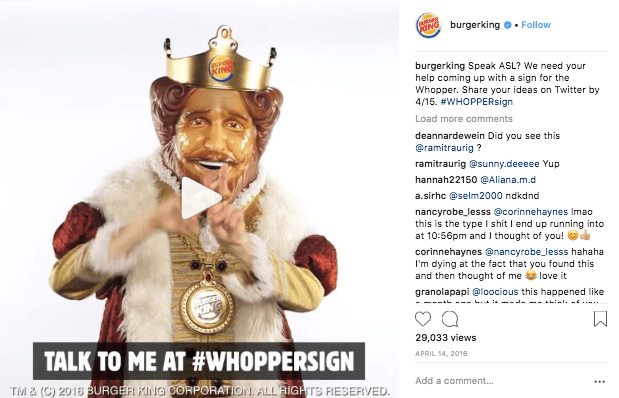 This campaign allowed ASL speakers to feel celebrated and involved in the creation of the ASL sign for the famous Burger King Whopper. The result was not only an increase in Instagram engagement but an increase in engagement across all platforms with people submitting photos, videos, stories and just about everything in between! The key takeaway is to make your followers feel involved in your brand’s journey through powerful calls-to-action in your captions. And don’t be afraid to use an emoji or two as 50% of all captions and comments on Instagram contain at least one emoji. The reason emojis can be powerful is because they help to bring yet another visual, storytelling element to the way you communicate with your audience. 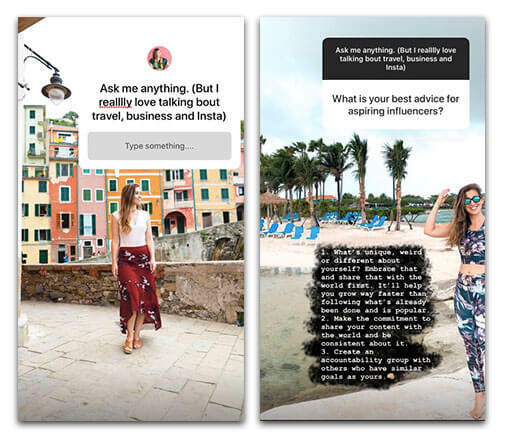 Instagram estimates that one in five stories receives a direct message. And with 70% of Instagrammers following brands on the platform, it’s no surprise that one-third of the most viewed stories are from businesses. And while that number is only growing, there are still a lot of brands out there who are not utilising the enormous power of Instagram Stories. And even fewer are using this feature to its full potential. Considering everything we covered in this post in talking about creating a human connection with your audience, it should come as no surprise that posts with faces in them receive 38% more likes than those without. And the same goes for Instagram Stories. People want to see the ins and outs of your life, which means that getting in front of the camera will have a bigger impact on your audience than if you’re simply behind it. 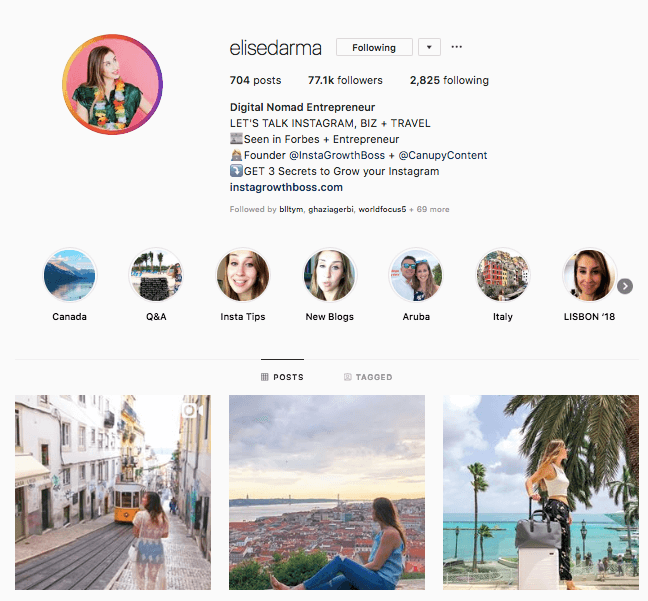 Take a look at the Highlights covers on @elisedarma’s account below, what do you notice about them? It’s a whole lotta her! This is the approach she takes to most of what she shares in her Instagram Stories. She’s not afraid to let her followers into her bed when she first wakes up in the morning feeling a little uneasy about the day ahead. She takes her followers on an adventure through the beautiful streets of Lisbon where she hosted her latest digital nomad retreat. People relate to imperfect moments and although they may not always remember who you are, they’ll remember how you made them feel. And the next time they see your face while scrolling through their feed or watching their Stories, they’ll remember. Of course, once again, people might think that getting in front of the camera and bringing out the human side of your business will be easier if you have a personal brand. They’ll often feature their staff and their amazing members in their stories by asking them questions related to entrepreneurship, community, productivity and just about everything in between. This allows their members to get exposure as they’re always tagged in the videos, while simultaneously promoting Make Lemonade’s emphasis on offering support, celebrating diversity and fostering collaboration within the coworking space. It also helps them show off all of their beautiful space and allow the viewers of their Stories to feel what it would be like to be a member. You’ve learned how to bring your images to life through the power of storytelling in your Instagram captions. You’ve also discovered the difference that sharing a real, raw and vulnerable moment can have on your Instagram engagement rates. You then learned why you need to include a call to action in your post, caption or even in your Instagram Stories in order to make sure your audience feels that they have something to engage with. Finally, you discovered the magic that happens on Instagram Stories, especially in front of the camera not just behind it. Now it’s your time to put these tips into action, but it’s important to note that all advice you find online is just that – advice. You need to find what works for you and your followers. You might read that Instagram posts generate 36% more engagement than videos, when in fact the opposite might be true for your own account. The only way to find out what works for your audience? Test, test, and test some more! 1) Pin this post for later. 2) Get out there, start testing out some of these techniques with your own Instagram posts and let me know what’s working in the comments! 3) And if you want 3 personalised tips for your very own Instagram account, be sure to sign up to receive our Super Simple Social Checklist (full of awesome Instagram tips) and reply to your welcome email with your Instagram handle!